Sticking to a dream can be as hard as founding a country, but someone’s gotta do it. Find out how 3 fifth graders are working to make their dream come true. And consider joining them! 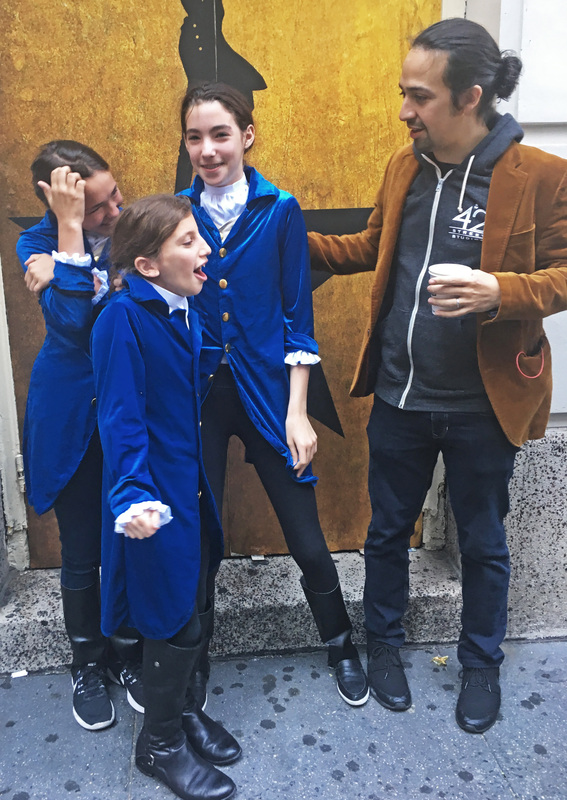 Outside the theater where Hamilton is playing, three girls meet their hero, Lin-Manuel Miranda. Find out more here. The Broadway show Hamilton began to seep into our lives through our ten-year-old daughter, one staccato rap couplet at a time. Pretty soon she had a whole song. Then another and another. She was Alexander Hamilton and Aaron Burr, Lafayette and George Washington, famous sisters Angelica and Eliza Schuyler, Hamilton’s wife. Choreography followed and then of course, the pulsing red desire to PLEEEEEEEASE SEE THE SHOW.